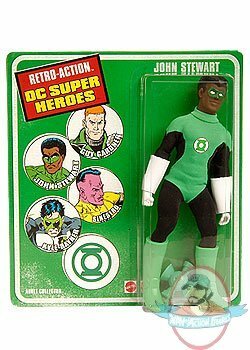 Retro Action DC Super Heroes John Stewart Green Lantern Mego Style 8"
Tough marine, Green Lantern Honor Guard, member of the Justice League… we couldn't think of a more deserving guy for the third of four exclusive 8" Retro-Action™ DC Super Heroes than John Stewart! This figure features a removable Green Lantern cloth uniform and power battery, and comes in a vintage style package. John Stewart traveled throughout the universe on his many missions, but you'll find this highly desirable figure right here on at Manofactionfigures.com!